We offer a variety of wooden stanchions from exotic to rustic to upscale in appearance, add country flare or high end class to your event space or business venue. 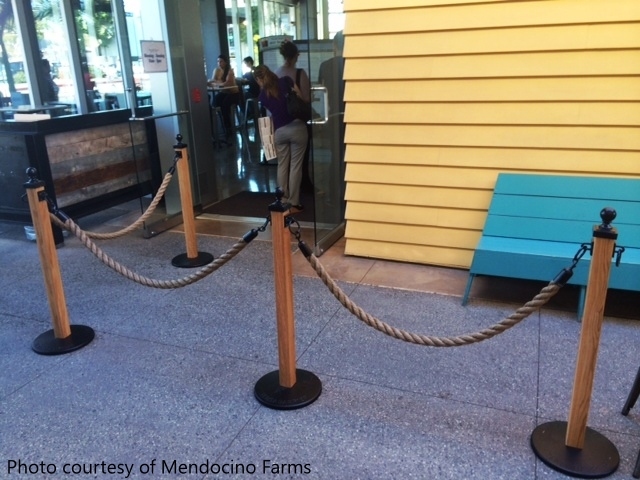 Stanchion Masters has created a heavy duty wood stanchion for outdoor use. These rustic beauties will look good in any park, botanical garden, country store, ranch, amusement park or western themed bar. Stanchion Masters wooden stanchions are built with eco-friendly Thermo hard wood (read more) and stainless steel hardware to withstand just about anything mother nature can throw at them. Harsh desert sun, frequent rain and knee deep snow have met their match! COLOR: Thermo Ash (shown) or Thermo Pine. Left unsealed or stained, they will patina to a gray over time. Your choice to seal or stain. We do recommend sealing when they will be used in frequently wet conditions. 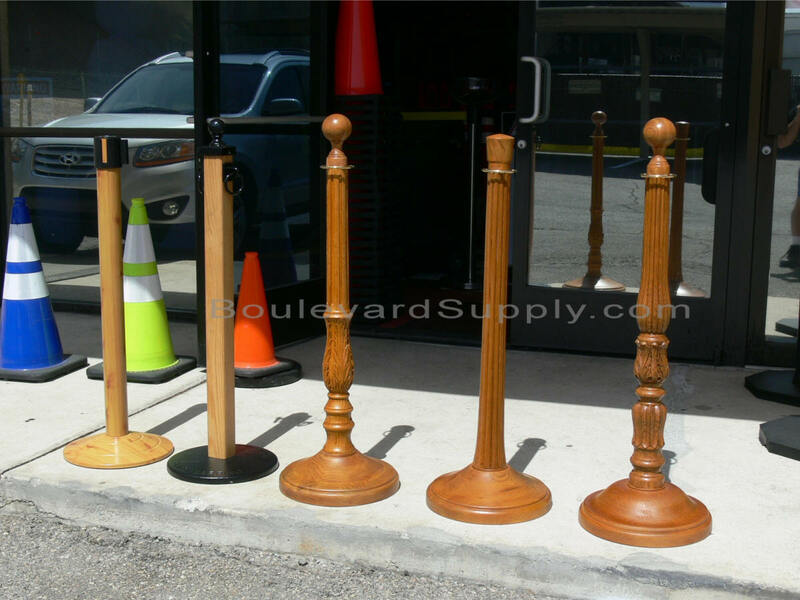 We have custom wood post stanchions for sale made with premium oak stained hardwood. 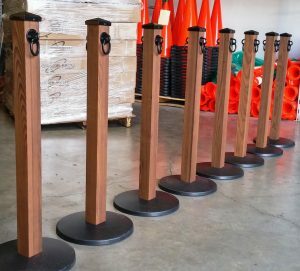 Southwestern style wooden post stanchions add a country ranch atmosphere while providing crowd control for your store or event. Tensabarrier 307 Hitching Post wood stanchions are recommended for indoor use only. Our rustic wood stanchions are available with Naugahyde, hemp or polypropylene ropes. A variety of rope colors and hook ends are available. 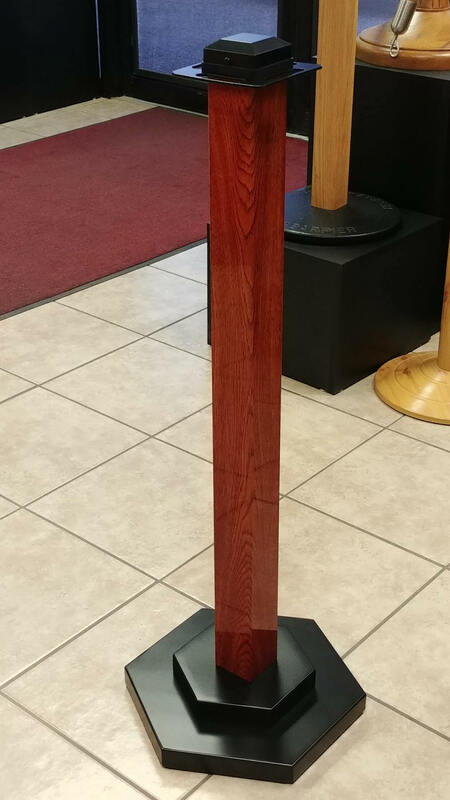 Available in a variety of red, white, brown and gray wood grain finishes, these premium faux wood stanchions are suitable for both outdoor and indoor settings. 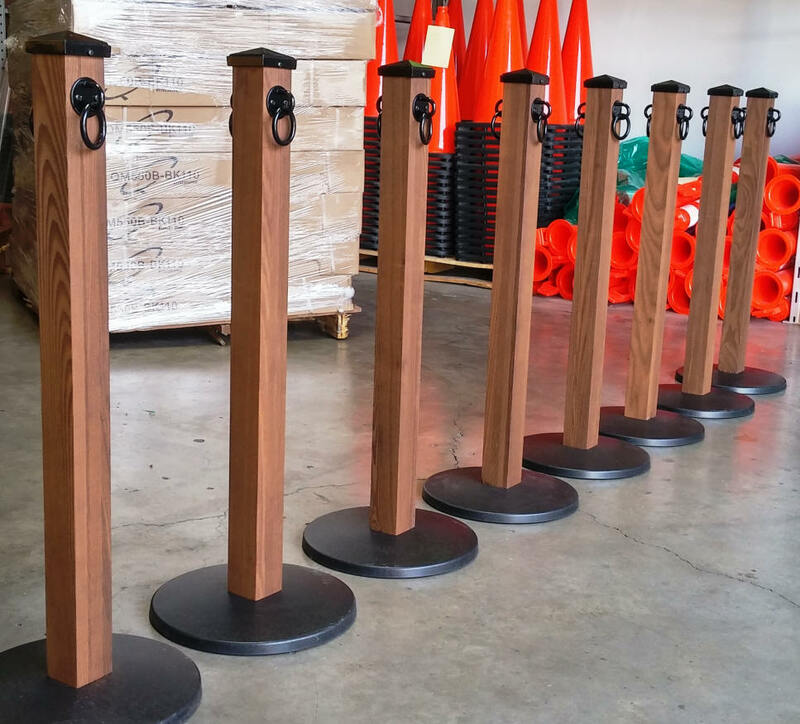 Upscale restaurants, wineries, financial institutions, 4 and 5 star resorts, hotels and casinos can all utilize these all metal stanchions to enhance their wood themed decor. 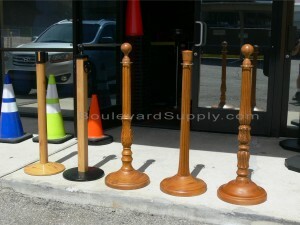 These high end all metal wood grain rope stanchions start at $239.95 each plus shipping. Other wood grain and powder coat finishes are available. Available with square real wood posts or in a multitude of powder coat or Decoral finishes, these square stanchions can be customized to fit in most any theme and are suitable for both outdoor and indoor settings. 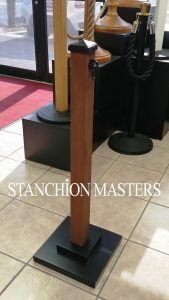 These decorative square stanchions from Stanchion Masters are a great fit for upscale hotels and resorts to country bars and wineries and start at $249.95 each plus shipping. POSTS: Choice of real wood ash, real wood pine for a rustic look. Or you can opt for an aluminum post that offers you a whole variety of powder coat and Decoral color choices. Starting at $249.95 each plus shipping, ropes sold separately. Powder coat and Decoral options available at additional cost. Square base with same posts are also available with the red oak wooden stanchions. ROPE CHOICES: We have a variety of stanchion ropes available from velour (velvet), naugahyde, leather, braided hemp and braided polypropolene which is recommended for outdoor use. Please have length and color of ends available when contacting us. It is recommended to use ropes no longer than 6′ in length with these stanchions.